Some Muslims agree with what Umar wrote, while others don’t. 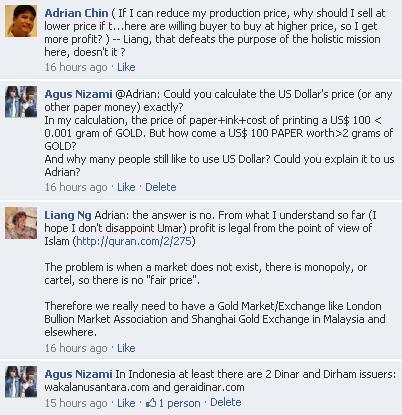 “@Adrian: Could you calculate the US Dollar’s price (or any other paper money) exactly? In my calculation, the price of paper+ink+cost of printing a US$ 100 < 0.001 gram of GOLD. But how come a US$ 100 PAPER worth>2 grams of GOLD? The problem is when a market does not exist, there is monopoly, or cartel, so there is no “fair price”. Therefore we really need to have a Gold Market/Exchange like London Bullion Market Association and Shanghai Gold Exchange in Malaysia and elsewhere. As to the cost of the value of the US100 note, costing only a few cents to print, who cares ? As long as people are happy to note its value that’s printed. As for the dinar and dirham, to me, the interest is not in the value of what it is actually, but the cost of forgery, after a while, when it picks up. The RM1 coin was so well forged, that the Govt had to pull it off the market after a few years. So I figure, if the dirham and dinar are not legal tender, then it’s free for all for everyone to forge. After so many postings, some replying to me, and many not, you are the first person who actually gave me numbers to validate a reason of some kind, so I’m sharing with you what I had in mind. Now you all know eh. Since the purpose is to create an alternative “currency” for trade, with the dinar and dirham, my reasoning is, you need the forgers to come in on the industry, to really propagate expansion of this. I’m looking at it from a software perspective. There’s probably a reason why there are more Windows OS systems than Apple powered OS out there, and in my opinion, counterfeit Windows OS, plays a large part in propagation of Windows. Well, if people could receive paper money as a US$ 100 worth more than 2,000 times of its value as currency, I am sure it will be easier for us to receive Gold/Silver that worth 1.1 of their real value. Though everyone could make Dinar and Dirham money, but people will only trust some credible institutions. 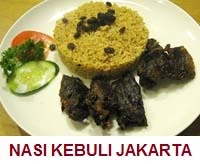 In Indonesia, there are 2 trusted institutions: GeraiDinar.com and WakalaNusantara.com. 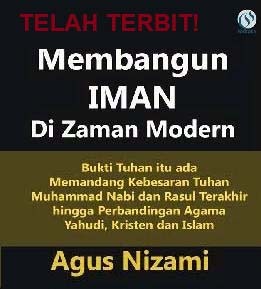 If government make it, it would be better. Is the Dinar really 4.25 grams of 22 carat Gold? Is the Dinar could be bought/sold easily with minimum spread? 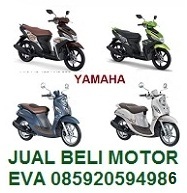 (in Indonesia the buy-sell spread only 4-6%). Comparing to 15% of inflation rate in Indonesia, keeping Dinar will give us yield 10% If we keep it for 3 years, the yield is 30% against Indonesian Rupiah. But the important is, Gold and Silver are currencies that have real values. It’s also riba (interest) free and far more inflation-proof than worthless paper money. It’s also the currencies that our prophet used. 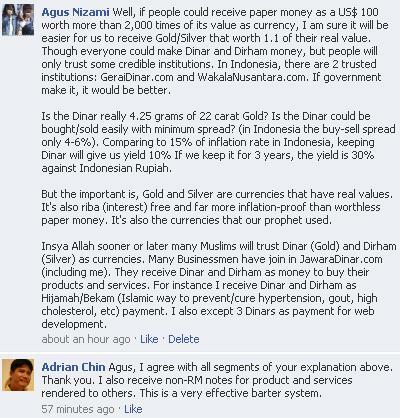 Insya Allah sooner or later many Muslims will trust Dinar (Gold) and Dirham (Silver) as currencies. 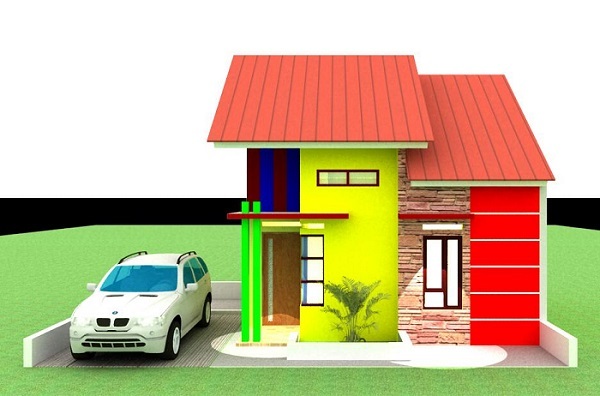 Many Businessmen have join in JawaraDinar.com (including me). They receive Dinar and Dirham as money to buy their products and services. For instance I receive Dinar and Dirham as Hijamah/Bekam (Islamic way to prevent/cure hypertension, gout, high cholesterol, etc) payment. I also except 3 Dinars as payment for web development. 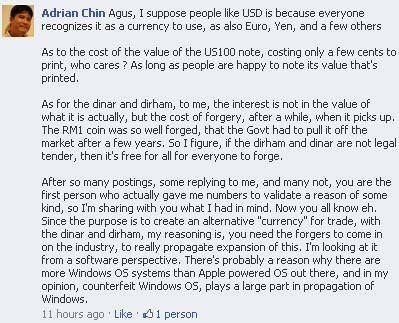 Adrian Chin Agus, I agree with all segments of your explanation above. Thank you. I also receive non-RM notes for product and services rendered to others. This is a very effective barter system.